Have you ever felt the urge to just do SOMETHING? That was me last night around two in the morning. I don’t ever go to sleep before that time, so my being awake was typical. But suddenly I needed to do something. Guess what I did? You might even be able to guess it. I reorganized my bookshelves! Ha! It wouldn’t surprise me if I woke someone up because it turns out that moving books around can be pretty loud when there’s no other sound coming from any other part of the house. But I still kept at it. I made two changes last night. First, I moved my trade paperbacks from my paperbacks shelf to my hardcovers one. And second, I alphabetized all my books by author rather than by title. I was able to add about a shelf of books to my hardcover shelf as a result of the reorganization. I don’t think my shelves look any better or worse after last night, just different. 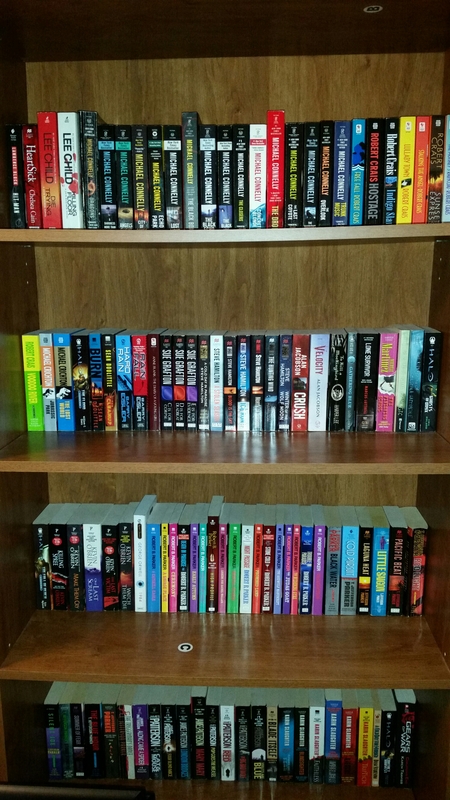 I realized that I now have 17 paperbacks by Robert B. Parker, the most of any author. And 16 by Michael Connelly. Tell me you’ve experienced this need to do something like I did last night, and what did you do? Or am I just weird? Here’s my visual of what I did last night. Hehe. Working Outside of Writing, Does it Help? Kind of a weird title. I’ll explain. Most writers start off doing something else. Maybe they work for a major tech company. Maybe they work as an accountant. Or they’re in marketing. They can be just about anyone, right? My question today asks if that work experience that usually happens before the beginning of a writing career helps. Some would say of course it does. Others would say it just takes away from time that could have been spent writing, or at least working on perfecting the craft. I obviously don’t have any real insight here, because I’ve never gone from a non-writing career to a writing one. But I do know about a few of my favorite authors. Marcus Sakey worked in marketing. Robert B. Parker worked as an English professor. I think. Michael Connelly worked as a journalist. Lee Child worked in TV. The list goes on and on. And the professions would vary widely from one author to the next. But knowing this still doesn’t answer the question if prior work helps with one’s writing career. I think there’s no doubt that it helped Michael Connelly. He wrote for the Los Angeles Times. But Sakey was in an office for six years. I’m sure he had a lot of time to think, but I don’t know if he actually learned anything he didn’t already know. Just about any writer on here is more polished and accomplished than I am. Maybe you have an actual response to a question I can only think about. Does the work you currently do or did in the past help with your writing? On this day in 2014 I published If you Could Jump Into any Story.